Introducing Sunset Ridge at The Lodges at Eagles Nest! This brand new 3,516 s.f. custom lodge is perched at nearly 4,800 ft. of elevation on a spacious 1.34 acres of gently sloping land, with southwestern exposure looking out over 100+ miles of rolling mountain vistas and the most dramatic sunsets the Blue Ridge Mountains have to offer! The 4 BR/3 and a half BA open floor plan offers vaulted ceilings throughout the main level and expansive deck space on both levels, floor-to-ceiling windows to take in the incredible views from the combined great room, kitchen and dining area and a huge stacked stone gas fireplace for convenience. The gourmet kitchen features a large island topped with marble, stainless appliances and custom cabinetry. Off the kitchen is a covered outdoor dining area with massive stone, wood burning fireplace and steps from the great room is the main level master suite. Downstairs find a casual den, second master suite, 2 guest bedrooms with a shared full bath, laundry and wet bar. 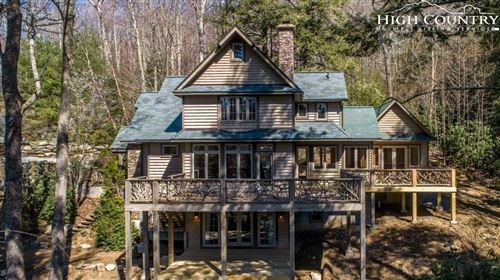 All of this within one of the most coveted sections of The Lodges at Eagles Nest, the hottest selling development in the Blue Ridge Mountains! Call today to schedule a personal tour!